Along with wisdom and prudence, equity is a major theme in the Proverbs of King Solomon. The purpose of those proverbs, says the King in chapter 1: 3, is “to understand the words of prudence: and to receive the instruction of doctrine, justice, and judgment, and equity.” But US policy makers are learning what Solomon probably knew: reforming existing hosing policy for more equitable management is no simple task. As Federal Reserve Chairman Ben Bernanke noted in recent remarks, revamping the government’s role in home financing must start with a clear idea of what that role should ultimately be. Currently, the government backs one in 10 new mortgages through Fannie Mae and Freddie Mac and the Federal Housing Agency, or FHA. 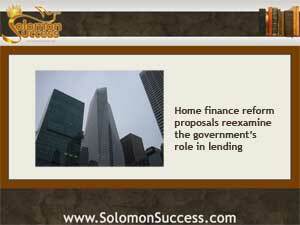 The government is also responsible for most of the refinancing and bailout programs for homeowners in crisis. New proposals by members of the Financial Services Committee would sharply curtail government involvement in those programs and shift some, if not most, of its services to private companies. Another area of concern in the proposed revamping of the system is the future of the traditional 30-year fixed rate mortgage, a mainstay of Jason Hartman’s investing recommendations. If the governments’ role in backing these loans is limited can the private sector fill the gap?